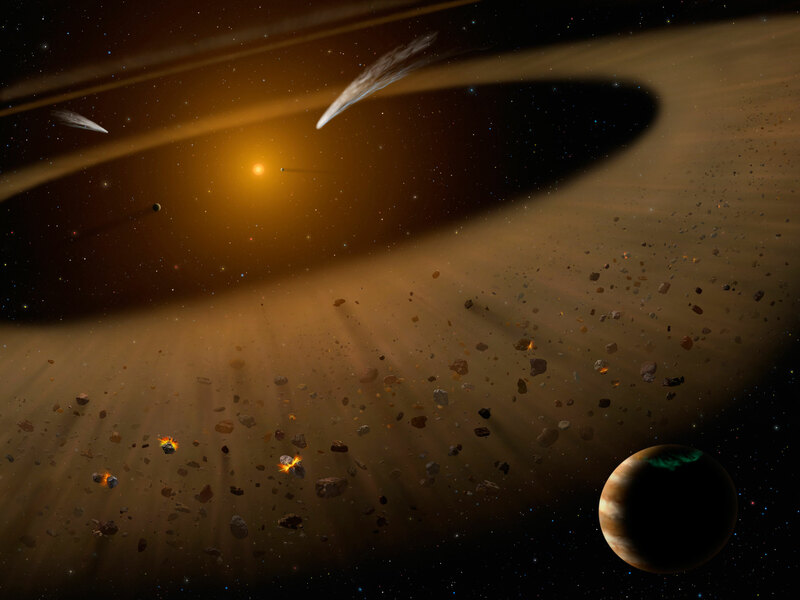 Artist’s illustration of the Epsilon Eridani system showing Epsilon Eridani b. In the right foreground, a Jupiter-mass planet is shown orbiting its parent star at the outside edge of an asteroid belt. In the background can be seen another narrow asteroid or comet belt plus an outermost belt similar in size to our solar system’s Kuiper Belt. The similarity of the structure of the Epsilon Eridani system to our solar system is remarkable, although Epsilon Eridani is much younger than our sun. SOFIA observations confirmed the existence of the asteroid belt adjacent to the orbit of the Jovian planet. Using data from NASA’s Stratospheric Observatory for Infrared Astronomy (SOFIA), astronomers confirm that the nearby Epsilon Eridani system has an architecture remarkably similar to that of our solar system. The star Epsilon Eridani, eps Eri for short, is located 10.5 light-years away in the southern hemisphere of the constellation Eridanus. It is the closest planetary system around a star similar to the early sun. It is a prime location to research how planets form around stars like our sun, and is also the storied location of the Babylon 5 space station in the science fictional television series of the same name. Using new SOFIA images, Kate Su of the University of Arizona and her research team were able to distinguish between two theoretical models of the location of warm debris, such as dust and gas, in the eps Eri system. These models were based on prior data obtained with NASA’s Spitzer space telescope. 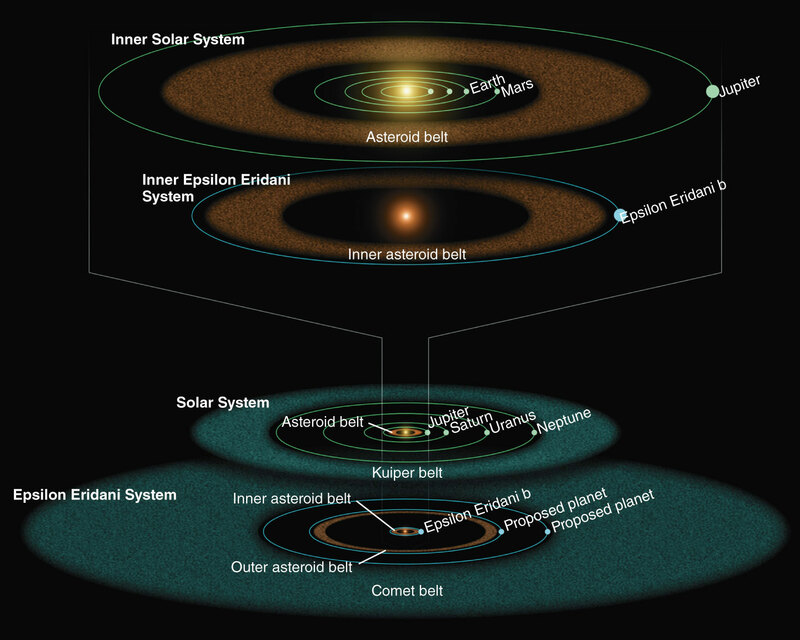 Illustration based on Spitzer observations of the inner and outer parts of the Epsilon Eridani system compared with the corresponding components of our solar system. Be the first to comment on "SOFIA Confirms Nearby Epsilon Eridani System Is Remarkably Similar To Our Solar System"